Acapella Triolons with “flaming” red horns, ii) the Berning 211/ 845 amps on the outsides, iii) Acapella La Musika Integrated amp in the center, iv) HRS equipment stand, v) Einstein preamp (top shelf, left side, vi) Ypsilon phono stage under the Einstein, vii) Kuzma Reference 4 Motor Turntable, and viii) EMM Labs XDS1 SACD player underneath. Cables are Jorma Prime. 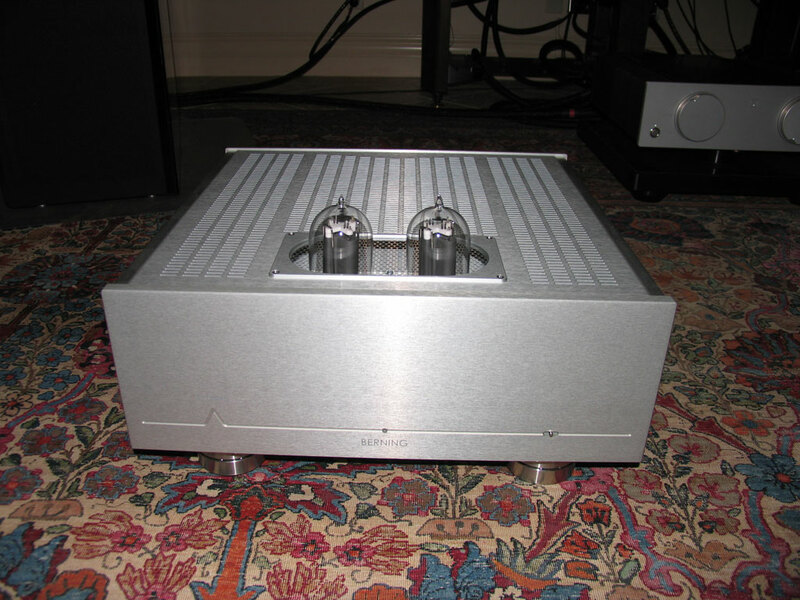 Many of you will be aware of Dave Berning and his previous efforts including the well-reviewed Quadrature amplifier, which in many ways set a standard for what could be achieved with an output transformer-less amplifier. The Berning 211 is to some extent the child of that amp. Like many of our children, it builds upon and far exceeds the strengths of the parent. The Berning is fully self-biasing and can use either a 211 or an 845 output tube without any changes or switching. It is equipped with a slow start feature that significantly extends the life of the output tubes and guarantees safe operation. If a tube will not come up to proper bias, the amp does not engage the faulty tube. Likewise the amp has three choices for operation: Standby, Conserve and Full power. At full power, the amp produces 60 watts regardless of load and has constant output impedance over the entire audio spectrum. The noise floor is sufficiently low for use with highly efficient speakers. The amp is differentially balanced with zero negative feedback. Another element of the design is the use of a rather ingenious switch mode power supply with full Power Factor Correction that allows the amps to run on 110 or 220 without internal modification. The chassis is by design light to avoid energy storage and uses a combination of Stillpoint circuit board isolators and their Ultra 5’s and Ultra Bases to isolate the internal circuitry from vibration. Thus, this is pretty much a plug and play set of amplifiers, except for the provision of a power cord. Why is Jim referred to as infamous? That adjective is typically used to describe someone notorious or disreputable. From both articles, seems like Jim is a good guy (with some serious high-end gear) so just wondering in what way he is infamous? Small clarification. The turntable system is a Kuzma Stabi XL4 turntable with Kuzma Air Line and 4Point tonearms. Note to Wayne: You are correct, Jim is a very good guy and a serious music lover who enjoys the pursuit. 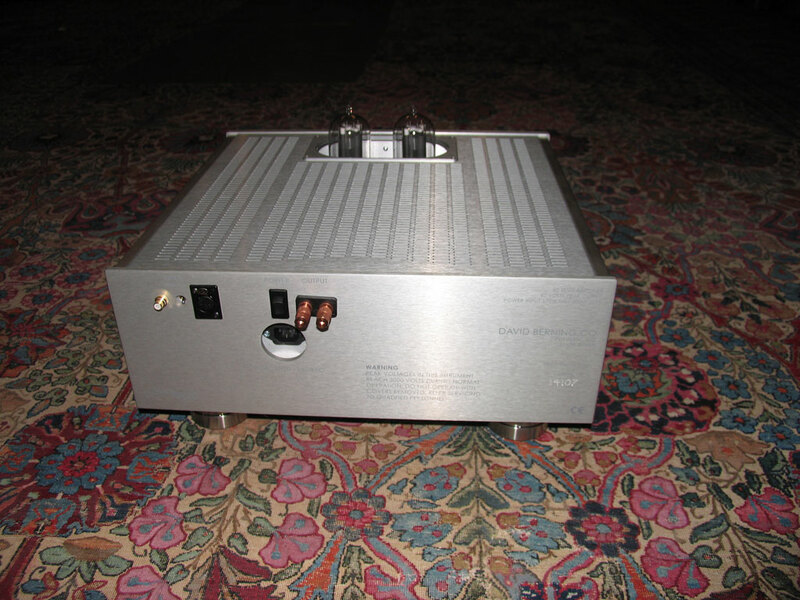 – The CS-2 is in contrast to the CS-1 not suitable for low powered tube amps. Does this eg imply that your Audio Note UK amps will not be a goid match for the CS-2? What minimum power would you recommend for the CS-2. – The anomaly you described with regard to the CS-2. Could you please comment on this point in somewhat more detail? I’m happy you eluded the Houston heat and humidity with a visit to San Diego. Jim had mentioned to me that you were friends. He is certainly a magnanimous host! 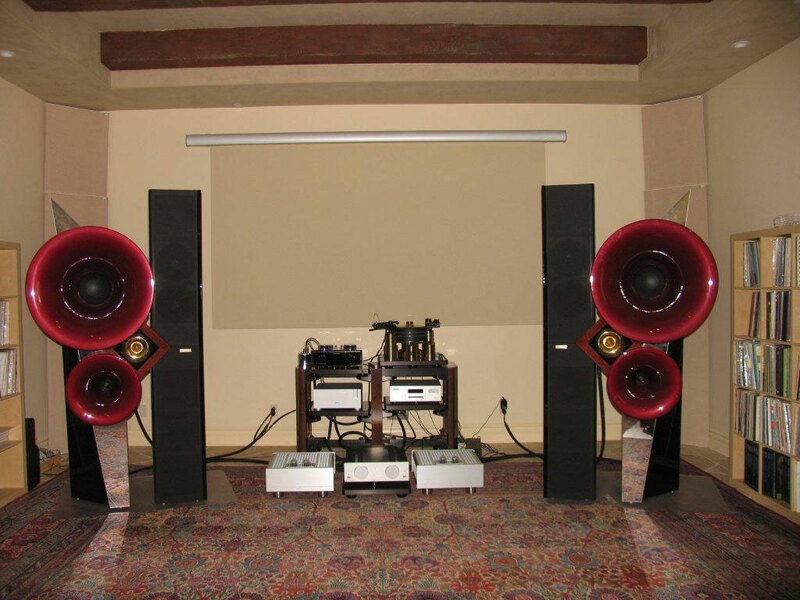 There are several dsadvantages to listening to equipment at someone else’s home, including but not limited to lack of familiarity with the room acoustics and inability to use your own equipment in the listening sessions. I wish that I had been able to try my Balanced Kegons on the CS-2. While I never thought that they would be the answer on the Triolons (93 db efficiency, complex impedance, 4 SEAS woofers per speaker), they have been an excellent match. Likewise the 60 watt per channel Berning 845/ 211 was superb. The manufacturer clearly prefers that the speakers be driven by higher powered amps. I certainly would not try using anything with less power than the Kegons. With respect to the frequency related anomalies, ideally, dynamic range should not be frequency dependent. 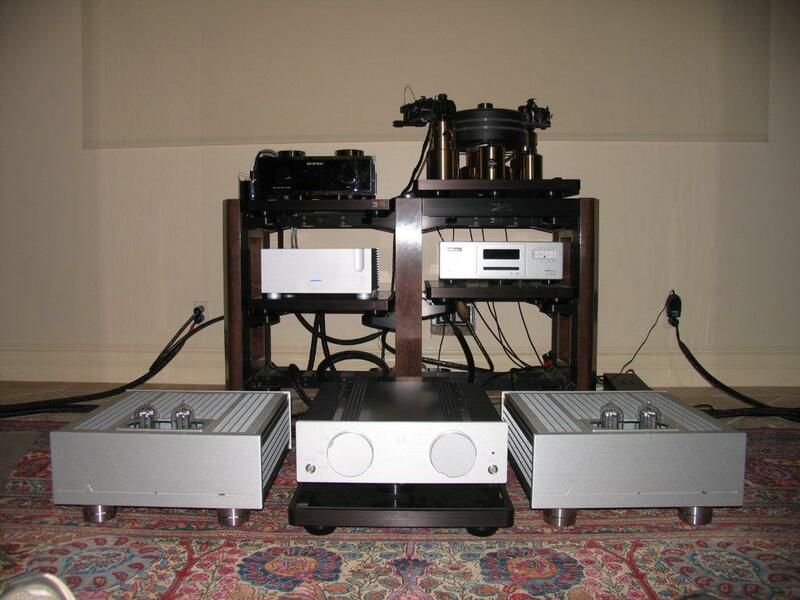 I can remember hearing a Levinson HQD system at a CES in Chicago. Seated at a proper distance from the rather large, multi-driver system, I thought that they were stunning at times; however, the 24″ Hartley woofers always seemed to get loud faster than the double Quads which called attention to the low frequencies. At any given volume, you could adjust the sensitivity of the system to get a coherent match; however, as the volume changed, you began to hear discontinuities among the drivers. In retrospect, part of what I was hearing may well have been related to the room rather than the speakers. In any event, certain frequencies played at certain volumes called attention to themselves. For the most part, it worked in service of the music. could you please explain why the marten m2 mono amp sound so bad? Anything wrong with this amps? The Marten amps under the right circumstances can sound very good, but they need a very lengthy warm up period (at least a week of being left on 24 hours a day with signal running through them) and they are very sensitive to the power cord used. We assumed that the top of the line Jorma Prime would be a nice match, but later found out that the half price Jorma Origo was the right choice. With these two changes, the Marten amps were very good particularly on the Marten Momento ($165K) speakers. I still prefer either the Acapella or Berning 211 amps on the Marten Supreme 2 speakers which are so highly resolving that they show flaws in lesser amps.